This deep-fried turkey has a crispy skin and juicy tender meat. Add oil to your indoor fryer, filling it somewhere between the min and max line and set the temperature to 350°F. 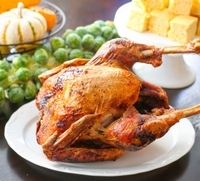 While oil is heating, gently rinse your turkey and then completely dry it with paper towels. If you have a frozen turkey you will need to defrost overnight and do a water bath (see note). Inject your turkey with marinade. Rub entire surface of turkey with dry rub. Slowly lower turkey into fryer. Cook approximately 3 minutes per pound. Drain turkey from oil and let cool for about 30 minutes before carving and serving. I found my turkey at Whole Foods, but if you can't find a fresh turkey you can use a defrosted frozen turkey. Learn how to safely thaw a turkey in this post. I used Stubb's Chipotle injectable marinade. I used this tutorial for reference. This recipe uses the Butterball Large Electric Fryer*.